Excellent palatability of a complete pelleted ration to enhance early intakes to drive gain and frame development. 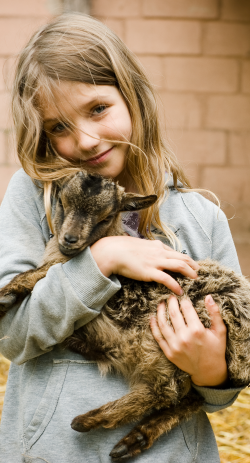 Contains high quality protein sources, and formulated to meet the critical mineral and vitamin requirements of young goat kids. 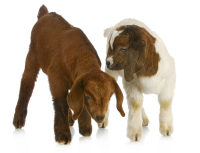 Designed for goats post-weaning, consistent quality and palatability ensure high intakes and optimal growth. Excellent palatability and early consumption results in faster gains , stimulates rumen development for a smoother transition postweaning. Market leading feed with excellent palatability and highly fortified with minerals and vitamins. Delivers a unique blend of high energy and protein ingredients to maximize milk yield and components. Economical pelleted ration that balances well with high quality forages in order to drive milk yield and maintain condition. Blend of protein, energy and fibrous ingredients designed for mid to late lactation milking goats. This product is designed to make up at least 60% of the goat's daily ration. This high protein and energy supplement is designed to be mixed with on-farm grains, or fed as a topdress. Excellent mineral and vitamin fortification. Specifically formulated with ingredients that help to prevent pregnancy toxemia prior to kidding. Begin feeding at least 3 week pre-kidding, and can continue feeding for a few weeks post-kidding to enhance intake and energy balance. A palatable 2:1 or 1:1 ratio of calcium to phosphorous, highly formulated with trace minerals and vitamins. A palatable 2:1 ratio of calcium to phosphorous, with chelated trace minerals for maximum bioavailability, aids in reproduction, somatic cell count and hoof health. Very palatable mineral in a block form, weatherproof (great for pasture), and very easy to monitor and control consumption. 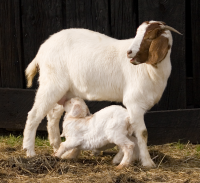 A supplement designed for small ruminants to be mixed with onfarm grains, an excellent choice especially for male goats as it has been formulated to prevent urinary calculi. Excellent product for high intakes that translate into high average daily gain, should be further diluted with on-farm grains to put on the final finish. This 20:18 milk replacer contains all milk proteins and has been designed to be fed to young kids from day 3 until weaning.